A variety of CFEngine and system properties can be changed in the Settings view. Settings are accessible from any view of the mission portal, from the drop down in the top right hand corner. 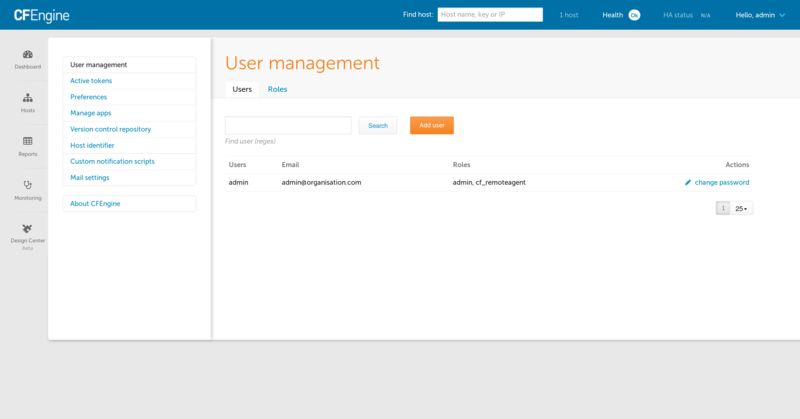 User management is for adding or adjusting CFEngine Enterprise UI users, including their name, role, and password. 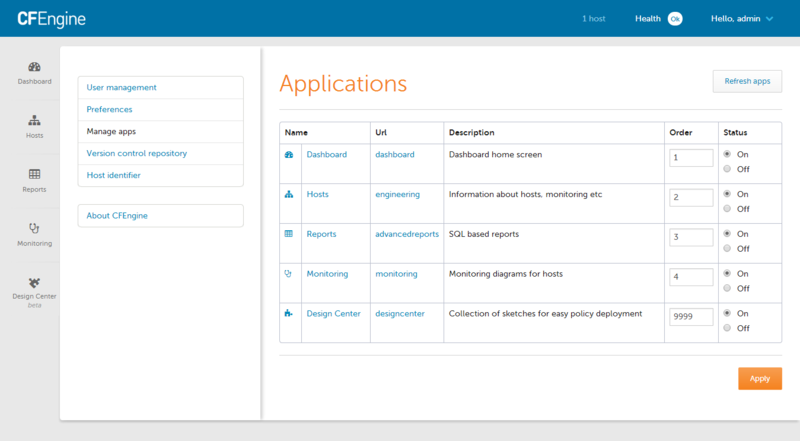 Roles limit access to host data and access to shared assets like saved reports and dashboards. Roles limit access to which hosts can be seen based on the classes reported by the host. 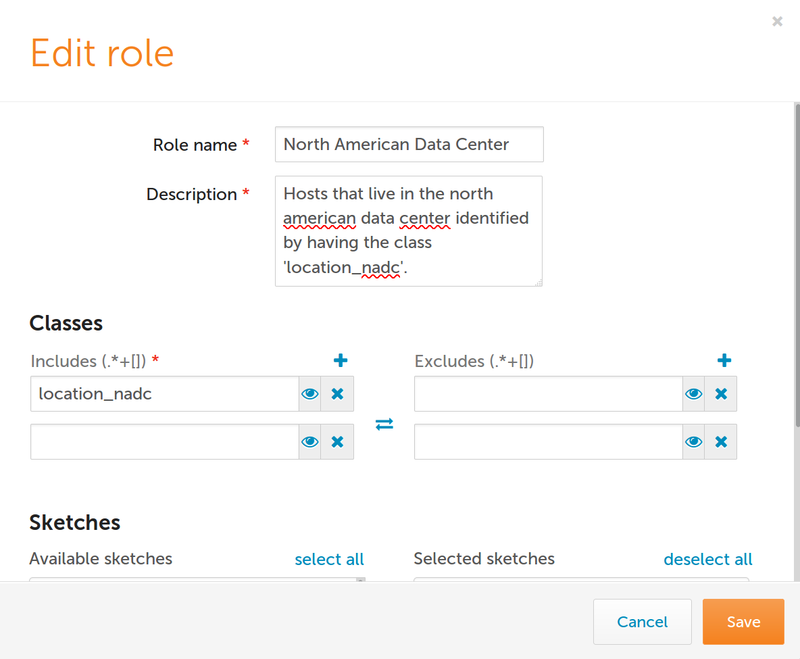 For example if you want to limit a users ability to report only on hosts in the "North American Data Center" you could setup a role that includes only the location_nadc class. When multiple roles are assigned to a user, the user can access only resources that match the most restrictive role across all of their roles. 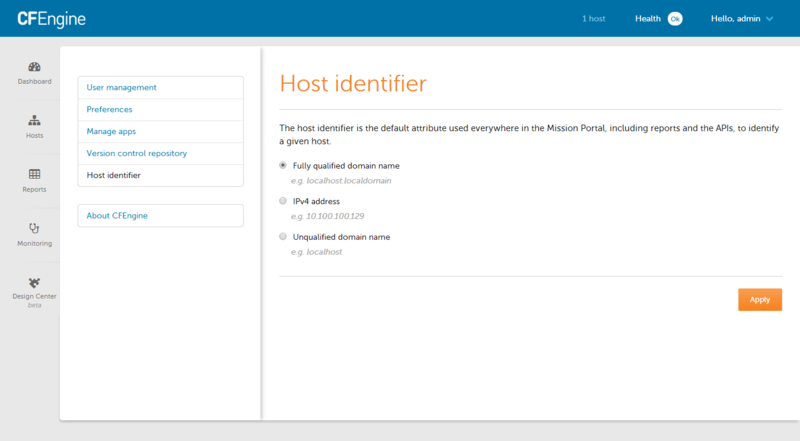 For example, if you have the admin role and a role that matches zero hosts, the user will not see any hosts in Mission Portal. A shared report will only be accessible to a user if the user has all roles that the report was restricted to. In order to access a shared reports or dashboard the use must have all roles that the report or dashboard was shared with. In order to see a host, none of the classes reported by the host can match the class exclusions from any role the user has. Users without a role will not be able to see any hosts in Mission Portal. User one has role SUSE. User two has roles no_windows and cfengine_3. User three has roles windows_ubuntu and no_windows. A report shared with SUSE and no_windows will not be seen by any of the listed users. A report shared with no_windows and cfengine_3 will only be seen by user two. A report shared with SUSE will be seen by user one. User one will only be able to see hosts that report the SUSE class. User two will be able to see all hosts that have not reported the windows class. User three will only be able to see hosts that have reported the ubuntu class. admin - The admin role can see everything and do anything. cf_remoteagent - This role allows execution of cf-runagent. 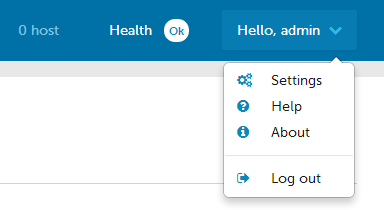 To set the default role, click Settings -> User management -> Roles. You can then select which role will be the default role for new users. Any new users created in Mission Portal's local user database will have this new role assigned. Users authenticating through LDAP (if you have LDAP configured in Mission Portal) will get this new role applied the first time they log in. Note that the default role will not have any effect on users that already exist (in Mission Portal's local database) or have already logged in (when using LDAP). In effect this allows you to set the default permissions for new users (e.g. which hosts a user is allowed to see) by configuring the access for the default role. Application settings can help adjust some of CFEngine Enterprise UI app features, including the order in which the apps appear and their status (on or off). 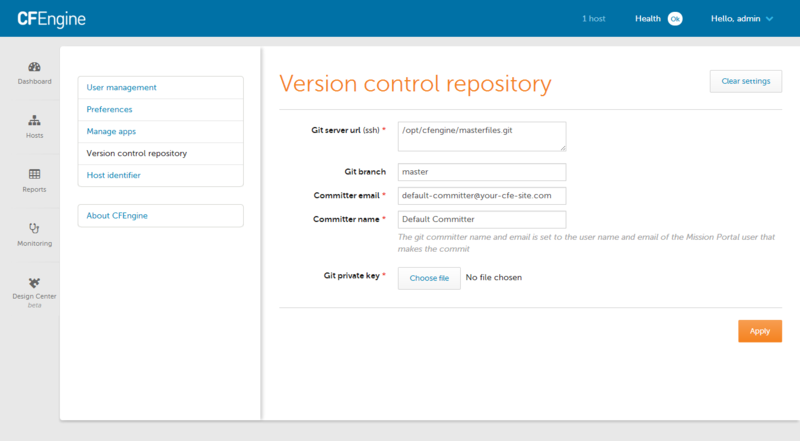 The repository holding the organization's masterfiles can be adjusted on the Version Control Repository screen. Host identity for the server can be set within settings, and can be adjusted to refer to the FQDN, IP address, or an unqualified domain name. Default from email : Email address that Mission Portal will use by default when sending emails. 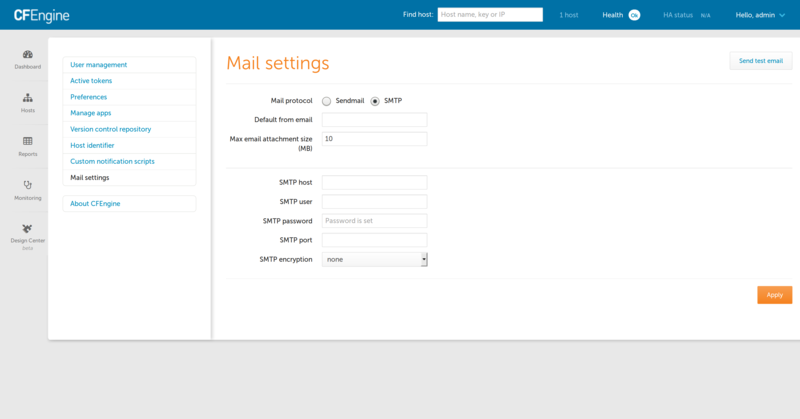 Mail protocol : Use the system mailer (Sendmail) or use an SMTP server. Max email attachment size (MB) : mails sent by Mission Portal with attachments exceeding this will have the attachment replaced with links to download the large files. Mission portal can authenticate against an external directory. LDAP API Url refers to the API cfengine uses internally for authentication. Most likely you will not alter the default value. LDAP filter must be supplied. 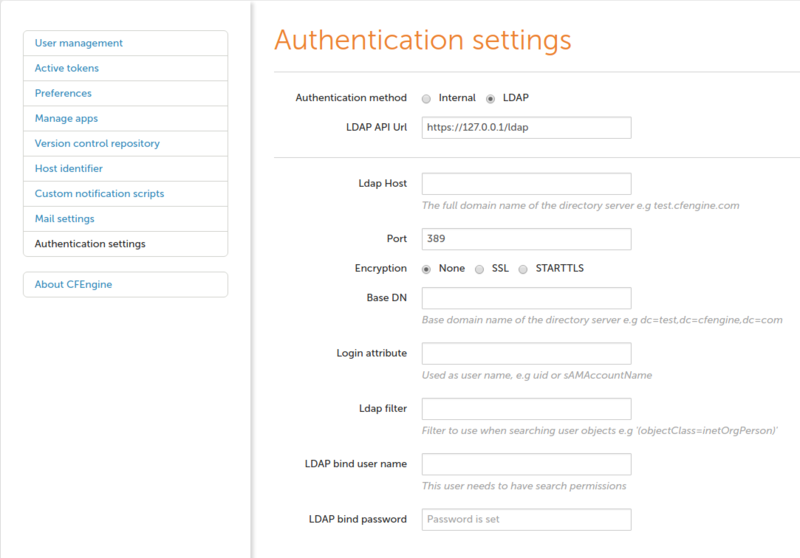 LDAP Host refers is the IP or Hostname of your LDAP server. LDAP bind username should be the username used to bind and search the LDAP directory. It must be provided in distinguished name format. 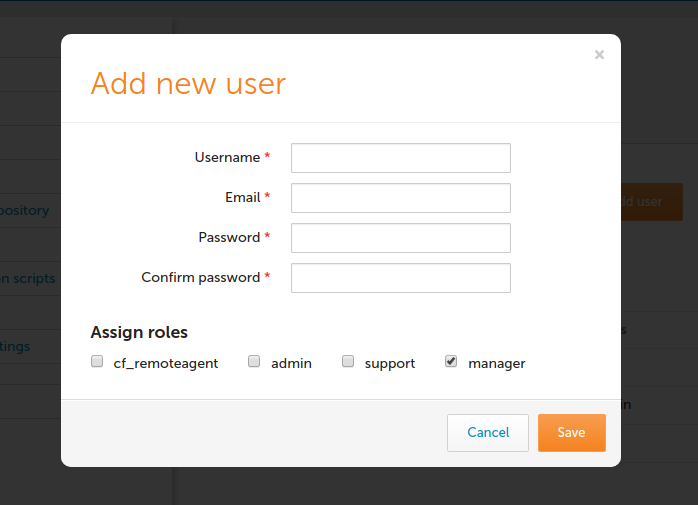 Default roles for users is configured under Role Management. 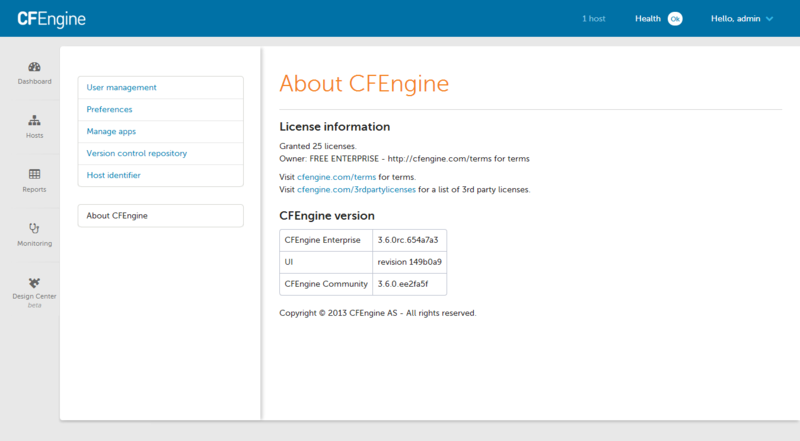 The About CFEngine screen contains important information about the specific version of CFEngine being used, license information, and more.